Inane, repetitive and illadvised? 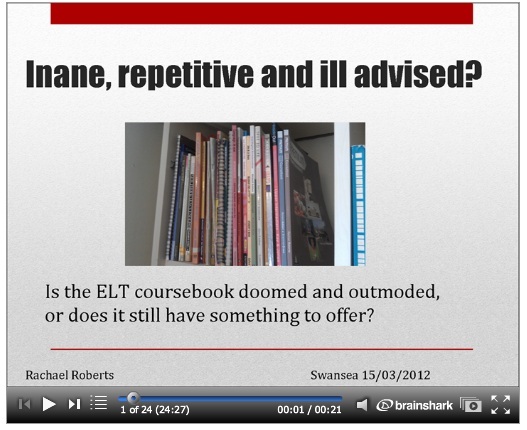 Is the ELT coursebook doomed and outmoded, or does it still have something to offer? This is a version of a talk I gave at Swansea University in March 2012. It’s about 25 minutes, plus time to read some of the slides, so get a cup of coffee first! How is the methodology behind a coursebook decided on? Are we now in an era of ‘textbook defined practice’? Should we be using coursebooks at all, and if so how should we be using them? Thank you for making me so welcome. I really enjoyed myself. I’d like to add my thanks to those already expressed by Neal. I learned a lot from your talk and it stimulated me to think differently about course books, their creation process and the end-users, that is learners AND teachers. You made the content of your talk accessible to all members of the audience and it hit just the right note, blending academic rigour with real-life teaching and learning contexts. Thank you so much for coming to speak to us yesterday. It was enlightened to understand the process that’s involved in writing and producing a CB. I also listened to the part of your talk on adapting parts of the CB and found them very useful. I think that both experienced and inexperienced teachers benefit from using coursebooks, albeit for varying reasons at times. Although, the criticisms against using it have, largely, to do with limiting creativity, the part of your presentation on DOGME shows that the opposite can also be true. Thanks again. This is food for thought and for my MA! Thank you, Georgia, both for your comment here and your insightful comments and questions yesterday. For somebody who always gets to see the final product of a coursebook writer`s work – the textbook-, the talk Rachael gave yesterday provides a useful and informative insight into the laborious process put into making it. 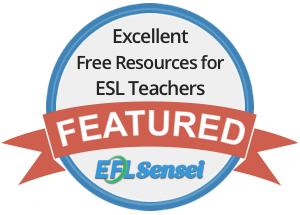 Altough most of the criticisms leveled at coursebooks are true, they are nevertheless a lifeline for beginner teachers who may not feel very confident in the classroom without them. As far as I am concerned, I`m beginning to see things in a different light and I believe that in the end it`s the teacher who should choose whether to follow what the textbook “tells” him/her or to use other, hopefully, more adequate materials ((context permitting). Thank you, Florin. I completely agree. Glad you enjoyed the talk and thanks for being such a great audience.